New! RouteSavvy Offers New Version with GPS Tracker Features Using Smart Phones! 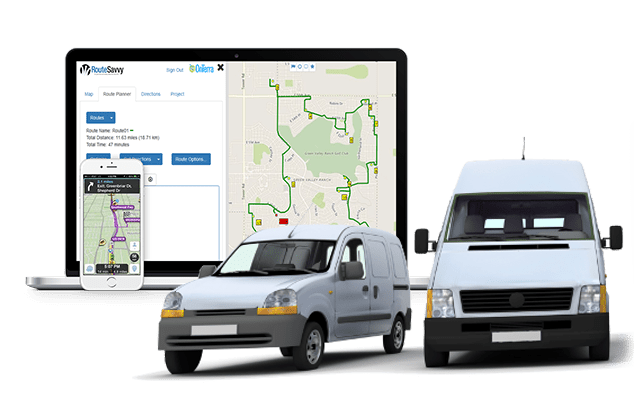 RouteSavvy™ is an affordable, easy-to-use online route planner that’s a small to mid-sized fleet owner’s best friend. RouteSavvy can optimize hundreds of routes, show multiple routes on the screen at the same time, and saves time and money that goes straight to the bottom line. RouteSavvy also is a MapPoint & Streets & Trips alternative. Let RouteSavvy transform your delivery, service, or sales business, with savings that go straight to your bottom line. Is Route Planning Software on Your Shopping List? Check out this Online Route Planner Buying Guide for small to mid-sized fleets. Want to learn how RouteSavvy Works? Watch this short video on how RouteSavvy works! RouteSavvy™ route planning software reduces miles driven & reduces your fuel spend! "As a small business owner, RouteSavvy Online has delivered exactly what I need...I now have 30-45 minutes a day extra to find and meet with new clients"
Sign up for FREE, 14-day Trial!